Udupi, Oct 10, 2016: Speaking after inaugurating the huge protest rally ’Udupi Chalo’ organised by Swabhimani Sangharsha Samiti (Bengaluru) at Udupi on Oct 9. 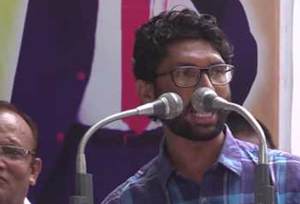 Sunday,Una Dalit Atyachar Ladat Samiti (UDALS) convenor Jignesh Mevani cautioned that the activists, along with Dalits and downtrodden, will enter Sri Krishna Temple and Asta Mutts if Krishna Mutt (seers) decide to go ahead with ’Pankthi Bheda’ in spite of the stiff opposition by the underprivileged and downtrodden. Mevani said plans will be chalked out to convene a huge rally demanding the elimination of evil practice of Pankthi Bheda in Udupi in another two months. He added that the seers and other authorities concerned should take a decision on the existing practice which is the height of discrimination. He called upon the gathering to take up agitation to put an end to the evil practice and uphold humanity. There should be an end to the inequity, he said. Stating that discriminatory scenario is worst in Udupi than in Gujarat, he urged the Karnataka and Gujarat governments to issue white papers on the amount of land given to the Dalits and Adivasis and also to the corporate. He questioned that if the land can be given to Adani and Ambani, why not to Dalits. The cow vigilantes and their organisations should be banned in all forms. Only the beginning : He said this is just the beginning and the unity among the people who protest against the injustice would prove detrimental for the so called Hindutvavadis. The Sangh Pariwar activists have become increasingly powerful after Modi became the prime minister, he charged. Coming down heavily on the Gujarat model of development, Mevani said that it is not of development, but of destruction. It is a model of Dalit annihilation, he added. Questioning the development taking place in Gujarat, Mevani said there are nearly 15,090 villages practising 96 styles of untouchability in Gujarat. From 2002 to 2014, 14,000 Dalit atrocity cases were reported. Dalits live under police protection in nearly 119 villages. In 2004, 14 Dalit women were sexually assaulted, while in 2014, the number was 74, he said. Gujarat government has assured 1,000 acres of land to Dalits on paper but has given not even 12 inches of land to them, he said. As many as 1,537 Dalits and OBCs were arrested following the 2001 riots, while only 27 upper caste men were arrested, said Mevani. Terming the coastal region as the Hindutva laboratory of Karnataka, he urged progressive-minded people to stop “the research” before it became too late. “Prime Minister Narendra Modi has been controlling the entire system just like a snake charmer who controls the snake. It should be stopped,” he said. Second experiment : Udupi Chalo is the second experiment next only to Gujarat and would usher in new hopes for minorities, Dalits, Adivasis, OBCs, farmers and labourers. It is the fight against evil practice of casteism and the campaign is taken up to uphold the dignity of every soul irrespective of the caste and religion. He said that Coastal Karnataka has been saffronised. Let the people in authority and Sangh Pariwar activists ’keep the tails of their cattle with them,’ but let them give the land to the landless needy, he added. Mevani urged that the fight for food and living rights should be taken up. He said the rigid opposition led by the strong condemnation would result in some hopes. The present evil in the socio-economic fabric should be dismantled. The land reform act should be effectively introduced all over the country. The ambitions and aspirations of Rohit Vemula should be kept alive. The samavesha passed resolutions demanding protection of food rights to the poor; curb on goondaism in the name of cow protection; allotment of land to the oppressed on priority; extension of job reservation in private sector and ban on ‘pankti bheda’ in Udupi Mutts. Earlier, a jatha was held from Ajjarkad grounds to Beedinagudde, the programme venue. Chief Minister’s media advisor Dinesh Amin Mattu and journalist Gowri Lankesh were present. Generally the girls ar not at all safe?it is not only the Dalits we have look upon the overall problems. We should not uplift the religion or community . Dalits are getting more benefits and now they are not the only target , But the problems face day the country generally.